Topology constructed based on Fuchs et al. 2008. This molecular analysis indicates Otus lettia as non-monophyletic with O. lettia ussuriensis sister to O. megalotis and O. lettia lettia as sister to O. bakkamoena and O. lempiji. Further phylogenetic studies of these species are needed to resolve this issue. Species whose phylogenetic position is shown as uncertain were not included in the analysis. Fuchs, J., J.-M. Pons, S. M. Goodmanl, V. Bretagnolle, M. Melo, R. C. K. Bowie, D. Currie, R. Safford, M. Z. Virani, S. Thomsett, A. Hija, C. Cruaud, and E. Pasquet. 2008. 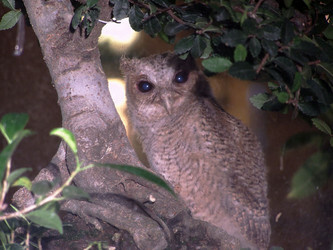 Tracing the colonization history of the Indian Ocean scops-owls (Strigiformes: Otus) with further insight into the spatio-temporal origin of the Malagasy avifauna. BMC Evolutionary Biology 8:197 doi:10.1186/1471-2148-8-197. König, C., Weick, F., and Becking, J-H. 1999. Owls: a guide to the owls of the world. Yale University Press. Page: Tree of Life Otus. 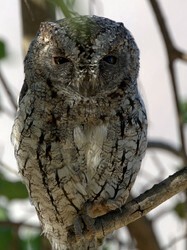 Scops Owls. Authored by Julia Gulka and David P. Mindell. The TEXT of this page is licensed under the Creative Commons Attribution-NonCommercial License - Version 3.0. Note that images and other media featured on this page are each governed by their own license, and they may or may not be available for reuse. Click on an image or a media link to access the media data window, which provides the relevant licensing information. For the general terms and conditions of ToL material reuse and redistribution, please see the Tree of Life Copyright Policies.